Zanini Auto Grup in Spain has installed its first automated Paint Line, the INUBIA P6 system from Oerlikon Balzers for UV lacquer coating of plastics components. With the new INUBIA P6 equipment, Zanini will be able to supply coatings based on ePD technology licensed from Oerlikon Balzers. “We see this as the beginning of a successful collaboration, as we plan to extend our capacities based on Oerlikon Balzers’ ePD technology within further systems in Europe, the US and China, in accordance with market needs,” said Xavier Serra Monté, Manufacturing and Engineering Director at Zanini. Oerlikon Balzers has developed the ePD surface technology that provides not only glossy look of metal, but also high protective requirements of automotive coating. 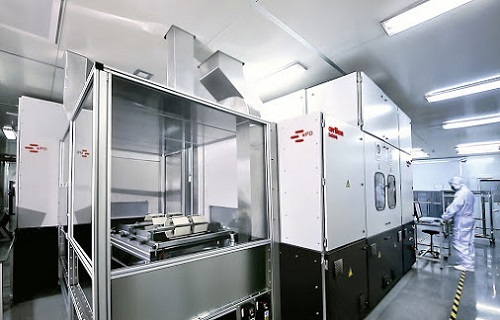 It is reportedly a more environmentally friendly alternative compared to conventional metallization technique as no harmful agents such as chromium VI or other heavy metals are used in the process. “ePD significantly improves material efficiency and safety, eliminates worker exposure to Substances of Very High Concern (SVHCs) and has no negative impact on the environment. It is more sustainable than conventional chrome plating as it saves resources and consumes less energy,” stated Bernd Fischer, Head of Oerlikon Balzers. Because ePD operates entirely without the use of toxic substances such as chromium derivatives, Zanini will not be affected by the restrictions arising from the European REACH environmental regulations that will apply to coating technologies requiring chromium VI. In a further step, Zanini has the option of increasing the capacity of the equipment by adding a fully automated in-line PVD coating system, thus combining PVD coating and UV paint technology to a fully integrated system.